I love holidays a lot and my family too, sharing and spending time together are great things about this events, the only part that I don’t really like is the amount of leftovers I have during this times of the year. Sometimes we eat leftovers for like a week, specially in thanksgiving, and by the time we finish I don’t really know what else to make with turkey; for easter, it very similar, but easier for me to create different recipes for my family to enjoy. This time I have lots of bread, and the perfect way for me to use day old bread it’s to make bread pudding. 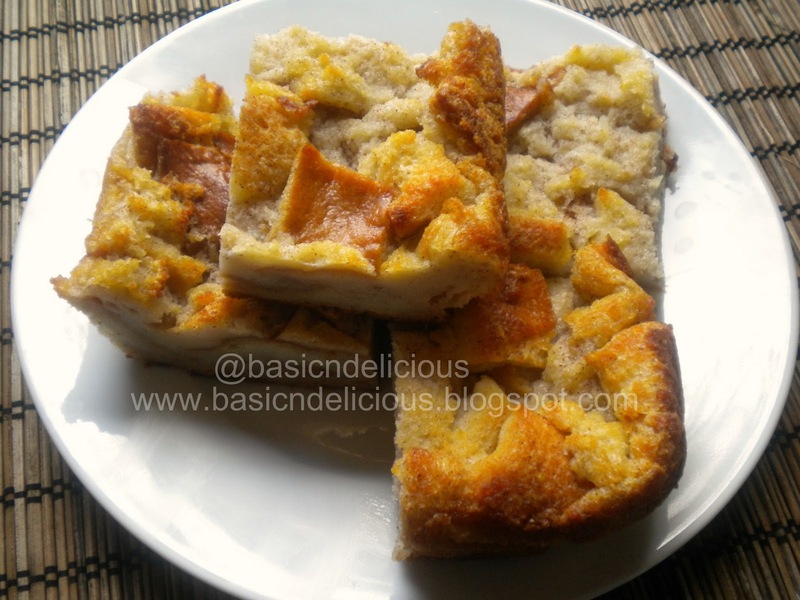 This is a great recipe if you want a bread pudding with a different twist, cheese and pineapple are the perfect combinations to make it more interesting and a little different from everything else. Not very sweet and cook to perfection, is definitely a new favorite in my house and maybe the new request for our easter dinner. Any kind of day old bread that you have, cut in pieces. In a bowl mix together, condensed milk, eggs, evaporated milk, nutmeg, pineapple juice and butter, then add cheese and pineapple, add to the bread cut in pieces, I used 1 loaf of french bread cut in cubes. With your hand start mixing all the ingredients until the bread is super soft and the liquid is completely absorb by the bread. Place in a grease mold, I used 4 little baking dishes the I recently bought but you can use any kind you like, just make sure you can fix all the mixture in it, don’t want to waste any drop. Bake for 50 minutes, serve hot or at room temperature. This recipe makes 4 small pans or 1 normal size. Need more ideas? Check out this wonderful recipes. What a fabulous theme we have this week, we were challenge to make something relate to our favorite movie or song, and of course I pick the want am the #1 fan, my all time favorite anytime of the year, Nightmare Before Christmas. I just love the movie so much the I have a lot of stuff of the characters, specially Jack Skellington. So I made in his honor this gluten free, low fat, low sugar, Pumpkin Pudding, a delicious option to for a light dessert after the holiday dinner, cuddle with your favorite blanket and watching this awesome movie. Spray a baking dish with some cooking spray, sprinkle the 2 tablespoons of brown sugar and the tablespoon of butter, then add the rest of the ingredients to a blender and blend until combine. Pour over the mixture above and bake for 1 hour or until completely firm. You can serve warm or cold, add apples or pears and even as an individual dessert with some homemade whip cream. This recipe makes 1 hold pudding. For more delicious recipes check out this links. This week we have very healthy and delicious recipes that are all low in calories and fat. So if you are looking for different and more healthy options you can not miss this #SundaySupper. A variety of recipes, with which you will be much easier to maintain that healthy diet. On this occasion I’ve made ​​a delicious chocolate dessert with almond butter, it is low in calories and fats, the most important thing is that these desserts are to be enjoyed without feeling any guilt. Is a delicious mixture that you can not miss. Again, I invite you to enjoy all the recipes we have prepared for you this week and remember you can do them without feeling any remorse or guilt. In a saucepan place the cocoa, sugar, cornstarch and half and half, stir well to dissolve the cornstarch. Put the heat and stir constantly until thickened, about 3 minutes, remove from heat and add the almond butter and chocolate German, stir. Place in a bowl, cover with plastic wrap and refrigerate until completely cool. Place 1/4 of the mixture into glasses or small bowls. You can substitute peanut butter or any other nut you prefer, remember to always take into account the difference in calories and fat in them. Check out more skinny and delicious recipes here. Join the #SundaySupper conversation on twitter each Sunday. We tweet throughout the day and share recipes from all over the world. This week we will be sharing out special skinnified recipes! Our weekly chat starts at 4:00 pm ET and you do not want to miss out on the fun. Follow the#SundaySupper hash tag and remember to include it in your tweets to join in the chat. Check out our #SundaySupper Pinterest board for more fabulous recipes and food photos. Join us Around the Family Table this Sunday at 4pm Eastern Time and share your favorite healthy recipes with us! This week has been incredibly fun with the #SundaySupper family, we have been creating retro recipes, those recipes that immediately transport us to our childhood. Those recipes that our mothers and grandmothers cooked over and over, it brings back many memories for me personally, the worst was when my grandmother stopped cooking my favorite foods as a child. The good news is that many of them are on the list of recipes this week and I can make them again and enjoy. One dessert that I loved was the bread pudding, my grandmother baked it once a week because usually we had day-old bread. My recipe is very similar to my grandmother, I made just a few changes because I think that she cooked is delicious. So I hope you enjoy it and try it. Cut sweet rolls into pieces placed in a tray and bake for 10 minutes, remove from oven and cool completely. In a bowl stir together milk, eggs, sugar, condensed milk, nutmeg and cinnamon, mix until everything is well incorporated. Add the bread to the mixture and let stand for 5 minutes, add the raisins, pecans and stir. Pour into a pan and bake for 1 hour and 10 minutes. Makes 36 individual portions can be served warm or at room temperature. And if you need more inspiration to make your own retro recipe here is the list from our retro family. Toast Topper #16: Grandma’s Mock Apricot Jam by Yummy What Smells So Good? Join the #SundaySupper conversation on twitter each Sunday. We tweet throughout the day and share recipes from all over the world. Our weekly chat starts at 4:00 pm PT and you do not want to miss out on the fun. Follow the#SundaySupper hashtag and remember to include it in your tweets to join in the chat. Check out our #SundaySupper Pinterest board for more fabulous recipes and food photos.